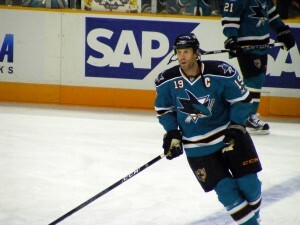 Yesterday the San Jose Sharks announced that they were stripping Captain Joe Thornton of his captaincy and Patrick Marleau of his alternate captaincy. They plan to enter training camp with a “clean slate” and let the players compete to earn the C and the A’s. OK then. Last season ended for the Sharks when they blew a 3-0 series lead to the eventual Cup Champion LA Kings. It doesn’t matter that the Sharks finished fifth in the league with 51 wins and 111 points. Apparently the “statistical revolution” currently going on in the NHL does not take into account things like sample size – which if it did, would mean that people recognize that 51 wins out of 82 games is a lot more significant than going 3-4 in a seven game series. Since we do not recognize the ridiculousness of this notion, fans and analysts alike clamour for change at the first sign of trouble. Yes, the Sharks have been a good regular season team for years and have always failed in the playoffs, however, contrary to popular opinion, this is rather meaningless. There is a far better chance that the Sharks have just been unlucky in the playoffs than there is that they are a team full of chokers. There is literally a zero percent chance that the reason the Sharks lost was because of the leadership – or lack there of – of Joe Thornton (or anyone on the team, for that matter). They lost, but there doesn’t have to be any blame. Someone has to lose and if there is fault to be had, it’s with the league for having a set-up that sees two such strong teams play each other in the first round. Certainly it’s not Joe Thornton’s fault that the NHL seeds its’ teams and tracks its’ standings in preposterous ways. Look, I know the NHL and their teams are not going to suddenly stop caring about public perception – it is as much of a business as it is a game. But, they could be a little less offensive about it. What the Sharks are doing here is akin to calling their fans stupid. If they feel changes are necessary, then make them. They didn’t. The Sharks barely had any roster turnover this summer (and this is a good thing, a 51 win team does need a lot of changes just because they got unlucky in the playoffs). They kept their coach and GM (again, good. It’s smart not to overreact). But why then do they feel the need to make symbolic gestures more likely to hurt their club then help it? And if all this sounds familiar, it’s because the Sharks did the same stunt in 2009 when they stripped Marleau of the Captaincy and gave it to Rob Blake. It didn’t make them any closer to the Cup then and it won’t do anything now. It is simply a move designed to make it seem like they are making changes and being proactive in their quest to win a championship. It just seems like they are patronizing their fans. Offering them up something meaningless and calling it “change.” Personally, I would have found it refreshing if they called a press conference after the season ended and said “Look, this isn’t the result we wanted, but we like our team, we think 50 wins is pretty damn good and we’re going to stick with it, despite what anyone outside the organization thinks.” In the world we live in today, people are smart, they are aware of different levels of media meanings and they know how to deconstruct messages. You can’t patronize your fans anymore, and the Sharks should know better than to pull this kind of meaningless manoeuvre and call it change. I call it a joke, and an insulting one at that. 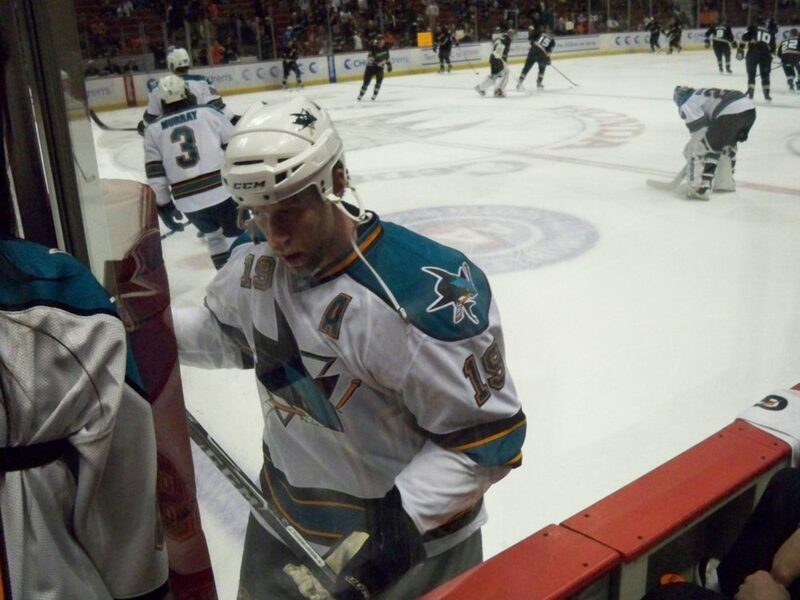 If they really had a problem with Thornton or his leadership, they’d trade him. Ten to one says they took him aside and explained it was nothing personal and that they really just had to look like they were doing something and that they’d consider it really cool if they he’d go along with it. If they didn’t do that, he’d probably be pretty angry and even maybe demand a trade (which is the other possibility since Thornton has a NMC and controls his destiny, but it’s hard to imagine them being that immature – I am sure if they said “we don’t want you,” he would say “fine,” and move on). Overall, I don’t care at all who is the captain of a team. I think it is a symbolic gesture and important only because you need to designate a guy who can go over and talk to the ref in order to maintain order on the ice. Leadership is something that you can’t really explain or quantify. Some guys are good leaders and others are not, but if you haven’t been around them you can’t really know for sure. Certainly management approved stooges do not make good leaders and whether or not he has a “C” on his jersey, Thornton will be the same “leader” he was previously. 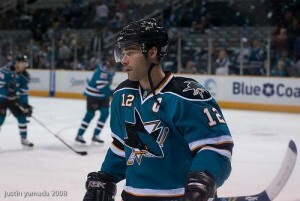 I do, however, think that beyond being insulting to their fans, this move insults a sure first ballot Hall of Fame player who has been nothing but class and production for his entire stay in San Jose, one in which has cemented his status as an all time great in the NHL and easily the best Sharks player in their short history. For that reason, this move is not just insulting to the teams fans, but an absolute disgrace. In reality, the only way to realistically give yourself a reasonable shot at the Cup is to build a team capable of winning 50 regular season games and hope you get lucky in the playoffs. The Sharks did that and whoever they give the captaincy to isn’t going to make a difference. This move can only hurt – it insults their best player and it insults their fans.